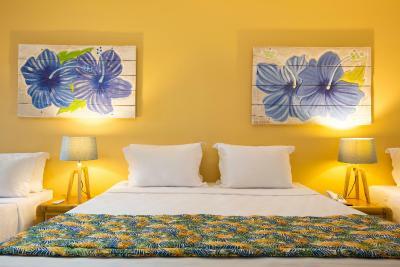 Lock in a great price for Hotel Armação Porto de Galinhas – rated 8.7 by recent guests! It s close to the beach and the town. The breakfast and dinner are nice. The best emploees ever. Everybody in good mood, helping us and making our stay the best they could. Me gustó mucho la variedad de servicios que ofrece, el hotel es sencillo pero muy completo. Me encantó la comida ya que es muy variada y te permite armar tu menú a medida. Las instalaciones no son pretenciosas, pero no les falta nada. Fui con mi mamá y mi hija, y las tres nos sentimos muy cómodas. La vista desde las terrazas del solarium es hermosa! Excelente ubicación. Muy buena la zona de piscina y playa. Muy recomendable para ir con niños. Excelente estrutura, programação adulto e infantil, café da manhã maravilhoso, camas confortáveis , funcionários prestativos. As crianças amaram as atividades kids. Os funcionarios são bem atenciosos, a programação de entretenimento com banda e show de maracatu, frevo e pagode, as brincadeiras para crianças. 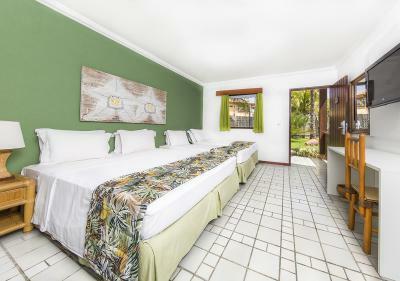 Hotel Armação Porto de Galinhas This rating is a reflection of how the property compares to the industry standard when it comes to price, facilities and services available. It's based on a self-evaluation by the property. Use this rating to help choose your stay! Ideally set in the white sands of Porto de Galinhas Beach, just 1.2 mi from the charming city center, Hotel Armação Porto de Galinhas offers swimming pools for children and adults, restaurants and a beach bar. WiFi is free. The air-conditioned rooms are colorful and spacious. Some provide a private balcony with a hammock. All rooms offer a mini-bar, a safe and cable LCD TV. Hotel Armação offers a wide range of services and activities, such as the kids' club, which provides recreational activities with an entertainment staff, TV sessions, art classes, games on the beach and competitions. For adults, there is a massage gazebo with a view of the beach, a tennis court and fitness center. A mom's kitchen, a baby's changing room and a nursing room are also available. For guests' entertainment, the property also offers a cinema and an on-site bar, where guests can enjoy drinks and snacks. Guests can also benefit from beach services such as beach chair and bar services. When would you like to stay at Hotel Armação Porto de Galinhas? This air-conditioned room comes in various sizes and have free Wi-Fi. It features a hairdryer, cable TV, minibar, telephone and safe. Some feature a balcony. Located near the front desk and restaurants, this air-conditioned room features a charming décor. It provides a flat-screen cable TV, ceiling fan, hairdryer, minibar, safe and free Wi-Fi. Some rooms include a private balcony. This air-conditioned room comes in various sizes and includes free Wi-Fi. It features a hairdryer, cable TV, minibar, telephone and safe. Some feature a balcony. House Rules Hotel Armação Porto de Galinhas takes special requests – add in the next step! Hotel Armação Porto de Galinhas accepts these cards and reserves the right to temporarily hold an amount prior to arrival. Please note that the property does not accept virtual credit card or third party credit cards. Beach is terribly dangerous with huge waves It is not possible for kids even to touch the water!! Rooms are comfortable but just one on top of another with lots of noises and no personal space (typical of Brazil) Breakfast is POOR for Brazilian standards. Juices were undrinkable and not natural. Only good was tapioca lady with best attitude and coconut / caramel tapioca. Value was bad for the amount we paid!! Food is too expensive. Some people who work there are not that friendly. My room was too noisy. Too many kids. Too noisy at all times. In particular, during breakfast and dinner the noise was quite something. I had been there before and it was much better. It seems that this hotel became a place for families in the last years. We miss a quiet place to read and to play cards during the night.